Lucky247 online casino has plenty of games to offer, enjoys an excellent reputation and is a mobile friendly operator. These are all solid reasons for prospective players to sign up for a real money account and start gambling. Another argument in favor of joining the casino is the Lucky247 rewards program, which rewards active players who make a deposit and play their popular games. The welcome bonus is the first present offered to new players, but there are plenty of other incentives for loyal members. The Lucky247 rewards are not only for members who play the long game, but also people who seek immediate gratification for their actions. That’s because the casino runs many promotions simultaneously and one of them goes by the name of Daily Deal. The name is self-explanatory and all those who have an account qualify for this campaign once they make a deposit of at least £20. Eligible players will unlock prizes over the course of seven days and during this period of time, they can bet the maximum of £6.25. Bonuses expire two days after being awarded and are subject to a 40 times wagering requirement so time is of the essence. To make the most of this opportunity, players should login to their accounts daily and claim the bonuses as soon as they are offered. All Lucky247 casino games qualify for loyalty tokens, as long as players bet real money and the conversion rate is of one token for every £10 wagered. There is no limit to how many tokens one can unlock, so this campaign encourages perseverance and helps loyal players stand out from the crowd. 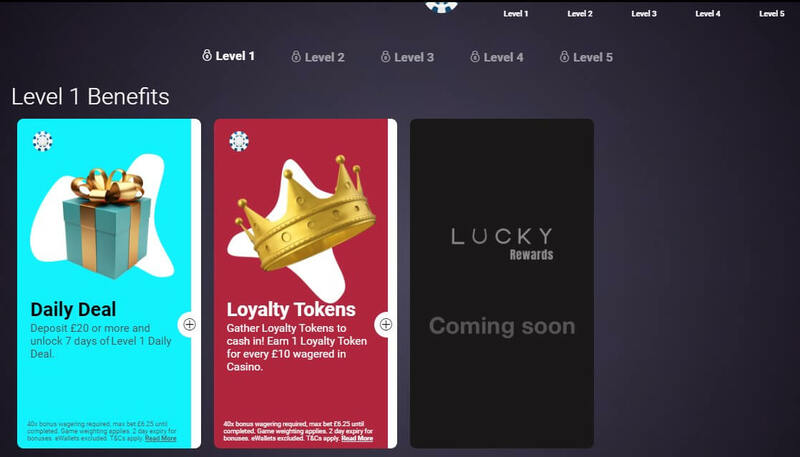 Eventually, they can convert 5000 loyalty tokens for £10 worth of casino bonus, which is again subject to the standard 40 times wagering requirements. Players should keep in mind that the loyalty tokens will expire 60 days after they were earned, so it’s wise to use them immediately. Any Lucky247 review will highlight the fact that as long as players respect the rules of these promos, they will have no problem in cashing out their bonuses on time and in full.